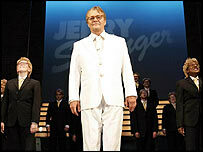 TV standards campaigners have urged the BBC to drop a broadcast of hit stage musical Jerry Springer - The Opera. The musical has been described as the most expletive-laden programme ever on British television. The BBC said it "contains language and content which won't be to some tastes" but it must cater for all audiences. But campaigners Mediawatch-UK said: "Licence fee payers do not expect the BBC to be pushing back boundaries of taste and decency in this way." In a letter sent to BBC chairman Michael Grade on Tuesday, Mediawatch-UK director John Beyer argued the show would breach BBC guidelines. "The continuous stream of obscene and profane language, as well as the debauched behaviour that characterised Mr Springer's TV shows, is unacceptable and will alienate a large number of viewers," he wrote. The show, filmed at the Cambridge Theatre, London, will be aired uncut by BBC Two at 2200 GMT on Saturday. The BBC said Mr Grade's office was not aware of the letter. The corporation is billing the broadcast as a "boundary-breaking show will appeal to all - except the faint-hearted!". A BBC statement said: "As a public service broadcaster, it is the BBC's role to broadcast a range of programmes that will appeal to all audiences - with very differing tastes and interests - present in the UK today." Warnings about the language will be given and it will be broadcast "well after the watershed", it added. The BBC has also denied reports in the Daily Mail that the two-hour show contains 8,000 expletives, which would equal more than one swear-word each second. Mediawatch-UK was formerly known as the National Viewers and Listeners Association, once headed by Mary Whitehouse.